This post originally appeared on Minxeats.com on March 21, 2013. I cook most weekends and sometimes I just don't feel like dealing with meat. Especially if everything we have in that department is frozen into a giant block in the freezer. That's when I turn to canned beans, which we usually seem to have in great quantities. My favorite is black beans, which I find to be very versatile. I've used them to make hummus, veggie burgers, and even beans and franks. This time, I was feeling especially lazy and decided on a simple ragout of beans and tomatoes, flavored with chipotle. We had a huge jar of pickled red bell peppers in the fridge; I had bought them by mistake, thinking they were an unusually-reasonably-priced jar of regular roasted peppers. The sweet vinegar tang of the peppers worked perfectly with the beans and tomatoes, and I didn't really need to use very much other seasoning, apart from salt and pepper and a bit of smoked paprika to reinforce the smokiness of the chipotle. I topped the ragout with poached eggs made with Kenji's technique, as seen in this video I posted the other day. They were pretty gorgeous, as evidenced by the photo above. In a 2 quart saucepan, cook onion in olive oil and a pinch of salt over medium heat until the onion is translucent and just beginning to brown, about 5-8 minutes. Add the garlic, chipotle, tomatoes, beans, red bell pepper, and smoked paprika. Stir, raise heat and bring to a boil. 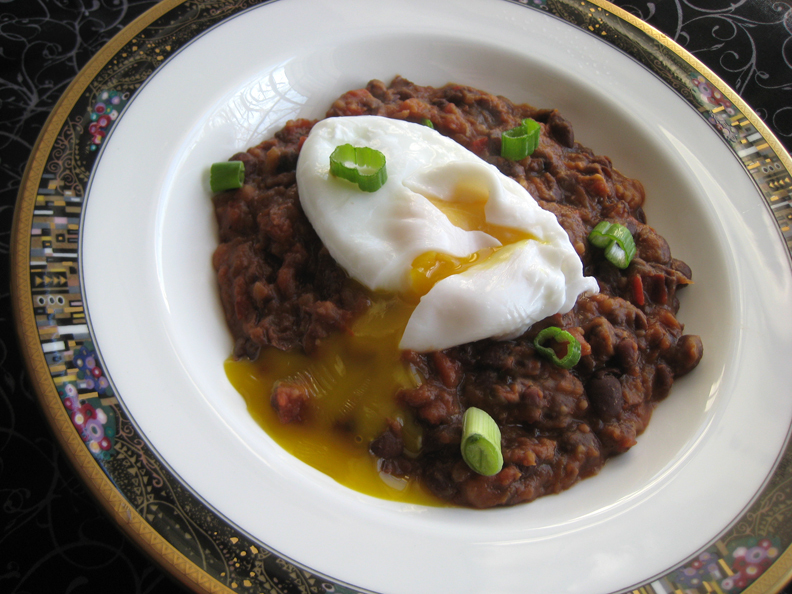 Turn heat down to low, cover pot, and simmer until beans are very tender, about 45 minutes. If there seems to be too much liquid left, turn the heat up for a few minutes to allow it to evaporate. Smash mixture with a potato masher until it's a very chunky puree. Season with salt and pepper to taste. Top each serving with a poached egg or two, or eat as a side dish. Makes a nice burrito filling, too.